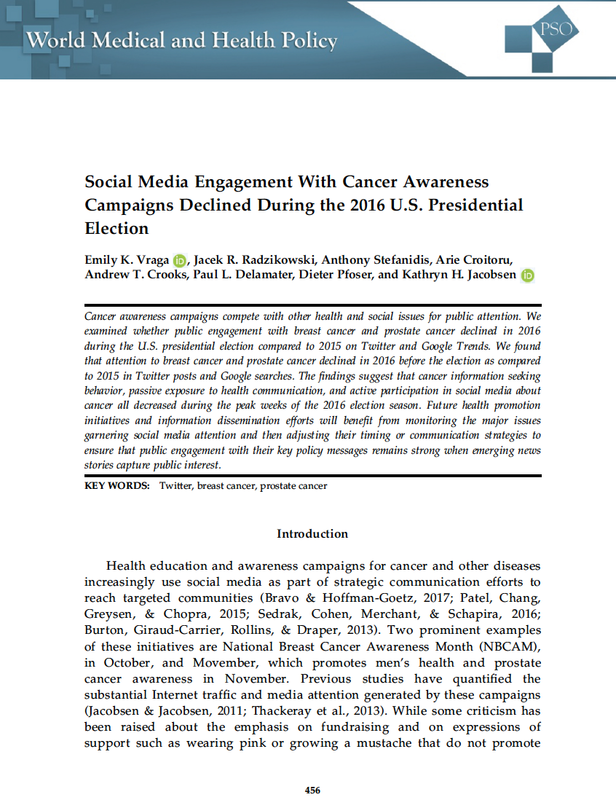 Continuing our work on geosocial analysis we recently had a paper entitled “Social Media Engagement with Cancer Awareness Campaigns Declined During the 2016 U.S. Presidential Election” published in World Medical and Health Policy. 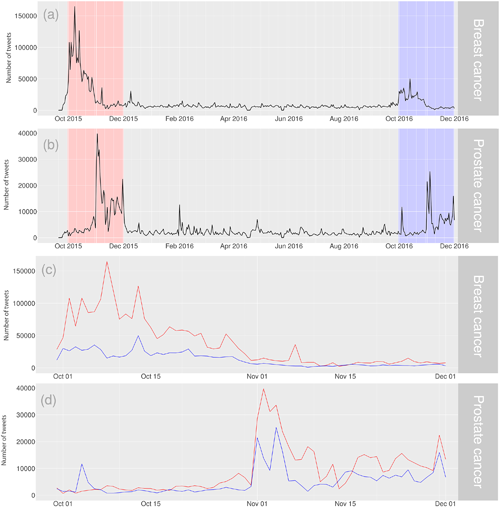 In the paper we show through the analysis of Twitter and Google Trends, how public engagement with breast cancer and prostate cancer awareness months between 2015 and 2016 changed. Specifically we found that attention to breast cancer and prostate cancer declined in 2016 (during the U.S. presidential election), when compared to 2015. Based on our finding we suggest that future cancer education campaigns—and campaigns for other health issues and policies—would benefit from monitoring the broader issues producing social media engagement, and adjusting their timing or communication strategies to ensure that public engagement with their key messages remains strong even in a crowded social media marketplace. Below you can read the abstract to our paper, see some of our key findings along with the full citation to the paper. Cancer awareness campaigns compete with other health and social issues for public attention. We examined whether public engagement with breast cancer and prostate cancer declined in 2016 during the U.S. presidential election compared to 2015 on Twitter and Google Trends. We found that attention to breast cancer and prostate cancer declined in 2016 before the election as compared to 2015 in Twitter posts and Google searches. 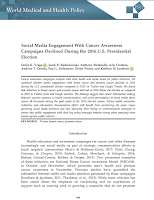 The findings suggest that cancer information seeking behavior, passive exposure to health communication, and active participation in social media about cancer all decreased during the peak weeks of the 2016 election season. Future health promotion initiatives and information dissemination efforts will benefit from monitoring the major issues garnering social media attention and then adjusting their timing or communication strategies to ensure that public engagement with their key policy messages remains strong when emerging news stories capture public interest. Twitter Traffic about Breast Cancer (a) and Prostate Cancer (b) in the Period October 2015–November 2016, and Comparison of October and November Traffic in 2015 and 2016 for Breast Cancer (c) and Prostate Cancer (d). All 2015 Data are Shown in Red and All 2016 Data are Shown in Blue.